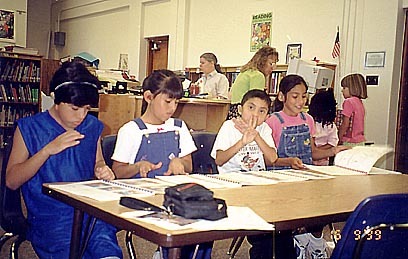 Deaf students Simon, Jazmine, Joe and Desi read SignWriting books while waiting to use the computers at Mark Twain Elementary School in Albuquerque, New Mexico. It is hard for hearing people to imagine what it must be like to be born-deaf. Many of us take speaking, reading and writing for granted. But actually all three are dependent upon good hearing. Reading is not based on sight alone - it is based on sounds. When hearing people learn to read, they "sound-out" the letters in each word, plus they are learning to read a language they already know how to speak. For born-deaf people to function in a hearing world, they must learn to read and write words - words they have never heard. Profoundly deaf people cannot "sound-out" words. They must learn to read from rote-memory, without sounds to help them. The SignWriting Literacy Project develops specially-designed materials teaching literacy to the born-deaf.